*All activities and admission to the permanent galleries on Friday nights are free and open to the public, but if you want to visit the museum's Special Exhibits, regular admission charges still apply. James Turrell’s “Three Gems” open during Friday Nights. Visit James Turrell’s Three Gems in the Osher Sculpture Garden during its optimal viewing time—at sunset. Open 5–8:45 pm. In 2014, artist James Turrell (b. 1943) contacted the Museums to refurbushThree Gems (2005), a site-specific “skyspace” located in a grass-covered hill in the Osher Sculpture Garden. The work was approaching its tenth anniversary at the de Young, having been installed during the opening of the new building in 2005. 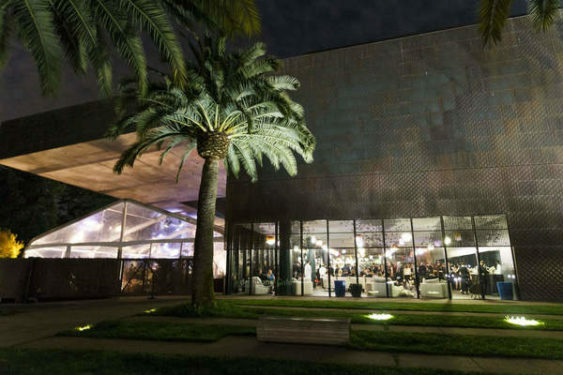 Every week, Friday Nights at the de Young offers art-making activities to encourage everyone of all ages to tap into their creativity. The Aqua Velvets are one of the world’s premier surf instrumental bands. Their sound is a blend of surf, latin rhythms, blues, lounge exotica, and free-form improvisation. Originating in San Francisco in the early 1990s, the Aqua Velvets released their first CD in 1992 on the indie label Riptide/Heyday Records. They were signed to Atlantic Records in 1995 with the release of Surfmania, and they are currently signed with Milan Records with which they have released Nomad and Guitar Noir.